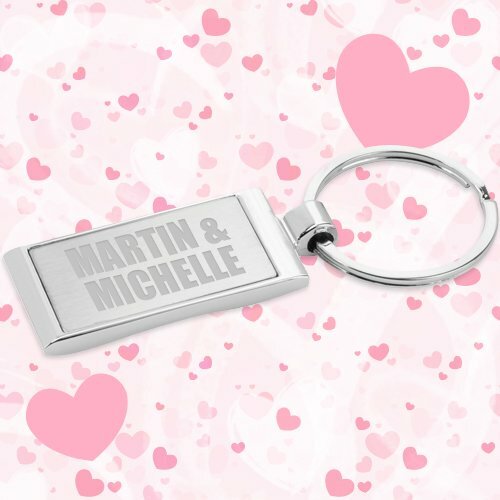 Personalized Wedding Favors Keychains w/ Wave Ring – Silver have a size of 0.188" H X 0.875" W X 2" D. Made of aluminum, these custom wedding keychains feature brushed silver and a metal split key ring. The 0.63" H x 1.13" W imprint area let you laser engrave brand logo or name well. Businesses and brands can exploit these products for promotions. Order these promotional keychains right now to get free design, best price guarantee and free online proofs. Request a quote to know price cuts that you can avail for wholesale Personalized Wedding Favors Keychains w/ Wave Ring - Silver.